The price of silver dropped $6 in 12 minutes during a time of initial low trading volume. The CME Group, which controls COMEX silver futures trading raised margin requirements several times as the price continued to drop, thus causing traders who held long positions to have to either add significant sums of money to their accounts or else liquidate their holdings. This could have been done on price rises, but that would have hurt traders holding short positions, who also happen to be the CME's most important members. Commodity trading firms told clients to sell silver, and they set new margins at $42,000, up from $9,500. The trading volume was at a record high thanks to high frequency trading programs. The mainstream media came out saying that silver was in a bubble, contrary to data presented by the Commodities Futures Trading Commission (CFTC). George Soros and other big hedge fund managers stated publicly that they were selling silver; since they had never stated they had purchased any, it may have been short selling. A large Mexican miner announced that it had sold short an additional 25 million ounces of silver, making it's total short position 95 million ounces, which is almost as much silver as all Mexican mines produce annually. The world's largest silver exchange traded fund (ETF), SLV, shipped out 35 million ounces of silver from the Trust; making it short about 10% of what it should have, and it's sponsor, BlackRock, hasn't done anything about it. By the end of the week, the price of silver had dropped by around $13, which was around a 30% drop. The CFTC stood by and did nothing to police the situation. The above summary information was compiled from several sources, including Ted Butler, Bob Chapman and Harvey Organ. The vast majority of financial news sources have been saying that silver has been in a bubble and/or had peaked in late April, 2011. They are making arguments based on short term technical analysis and emotions, but they ignore important information about silver's fundamentals and the current market structure. Ted is an options trader by profession, and his whistle blowing has aided and inspired thousands of investors to speak up about the ongoing manipulation. He relies heavily on his in-depth knowledge of the CFTC's weekly Commitment of Traders (COT) report. Recently, he observed that the recent price smash was different from previous manipulative price drops. This time, the speculative long traders are not holding large amounts of contracts. Instead, speculators on the COMEX have been selling more than buying lately. Also, JP Morgan, a bank that is at the center of the manipulation, has been urgently covering their short positions for the last few weeks, especially on price rises. 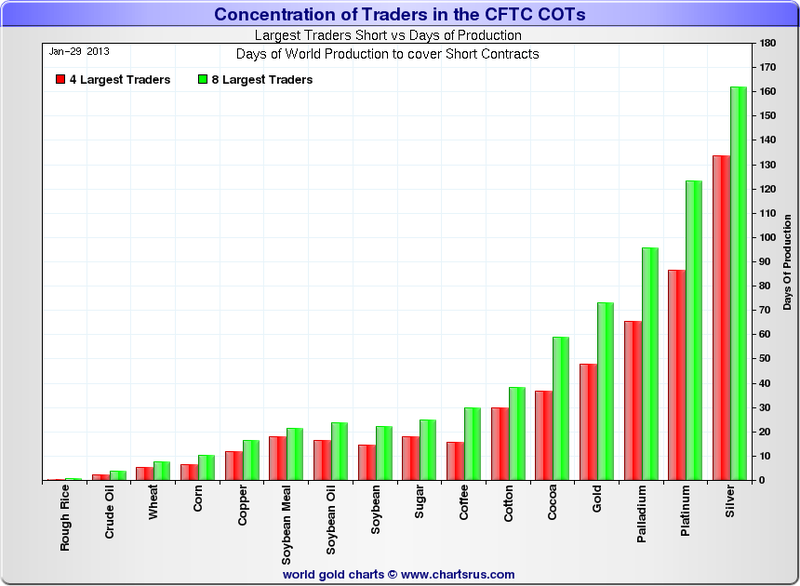 Harvey Organ also has good information about the COT reports and other gold and silver market news. Jason Hommel is another silver expert who utilizes the COT reports and also a broad number of sources to help small investors understand what's going on. He tends to focus on the strong fundamentals of silver as both a monetary and industrial metal. Due to the fraud of fiat currency, numerous financial experts are predicting a collapse of the US dollar and other currencies, since none are backed by gold or silver or anything tangible. This would have cataclysmic results all around the globe. Richard Maybury, author of U.S. & World Early Warning Report, says the fall of the American Empire has begun. Richard Russell, author of Dow Theory Letters, says that its just a matter of time before gold will go up significantly, as people realize that their paper money is worth less and less and decide to trade it for things with value. Bix Weir, author of The Road to Roota Letters, believes that the world will go through a painful and orchestrated economic collapse in which all paper assets will be at risk, so he strongly advises holding physical gold and silver. Most of the men holding this view tend to think that the US will come through the painful time with a gold-backed currency and return to a golden age. They also tend to think that the prices of gold and silver will be much, much higher than they are today. Jim Rogers and Jim Sinclair hold a similar view, except that they seem to believe that the US will decline, and China will emerge as the next superpower. Bob Chapman worked for US intelligence as a young man. He has a very high IQ. He also had a very successful stock brokerage firm, specializing in gold and silver mining shares. He is the author of The International Forecaster, a biweekly publication focusing on important financial and political news around the world. He has many good inside sources. He has followed the work of the global elite, also called the illuminati for over 50 years. He believes that they intend to try to collapse the world's financial system and set up a global system called the New World Order (NWO). He also believes that the manipulation of gold and silver prices is done on behalf of the US Government via the President's Working Group on Financial Markets, also know as the Plunge Protection Team. The manipulation is part of psychological operations (psyop) to make the masses feel that the US dollar is a safe haven for storing their savings. He further believes the gold and silver price suppression and mining share price suppression are part of a larger plot to destabilize governments and start WW3. Other men holding a similar view include Gerald Celente, Alex Jones, Max Keiser and Jesse Ventura. Stan Deyo is a scientist who formerly worked on anti-gravity propulsion for the illuminati. He has written books and published scholarly papers. He has also come up with a new theory of gravity and planetary magnetism that explains the polar shifts and earthquake and volcanic activity. He believes that something is causing our sun to produce more solar flares, which in turn are causing the earth's core to heat up, which is causing the earth to expand and have earthquakes and volcanic eruptions. His friend, Steve Quayle, a precious metals dealer, also believes this. They believe that it is possible that the world's leaders know of it but only leak the information to the public via indirect means, like the 2012 movie. There is evidence that the global elite are making survival preparation and also storing up precious metals. To fund the preparation efforts, they have been printing fiat money like crazy and building underground cities and military bases. Thus, the silver price suppression is merely one part of a larger plan for self-preservation. Thus, the recent series of unfortunate events may have simply been an attempt to shake the silver out of the hands of little guys. The idea of astro-catastrophism can perhaps be linked to Bible verses in Matthew 24 and the Book of Revelation about the days before the return of Jesus Christ. Some of Steve Quayle's ideas can be heard from Greatest Cover-up in the History of the World. Another Christian who holds a similar view is Benjamin Baruch. So what do we do in response? An inappropriate response would be to ignore the ideas that seem strange. Instead, we should investigate the truth. "If you haven't put the finishing touches on your emergency preparedness supplies of food, water, etc., please do so now ... I hope the collapse of the US empire and global political matrix evolves gradually, giving us plenty of time to accumulate more supplies before the last minute rush cleans out the stores, but it's better to be a year too early than a day too late." Ted Butler Archives, on Investment Rarities' website. This article is public domain. This page was last updated on 03 February 2013 .